The beginning of a new year is a great time to look ahead at what to expect in the world of content management and content marketing. Yes, mobile will continue to be of paramount importance and organizations will commit to responsive design, but that’s not really news at this point. 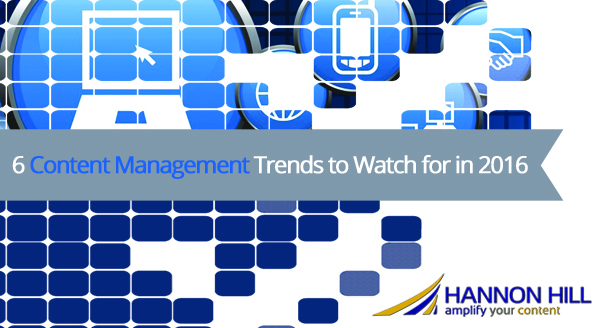 Let’s take a look at some other trends to watch for 2016. As we pointed out in one of our previous blog posts, measuring content effectiveness is not just one of the top priorities for marketers in 2016, but, according to Content Marketing Institute’s 2016 Benchmark Report, it is also the second biggest challenge. In today’s world, content management systems need to provide ways for contributors to better understand how well their content is performing. One of the biggest misconceptions with regard to analytics is that the number of pageviews reflects the performance of your content. However, just because you have a lot of pageviews doesn’t mean you are attracting the right kind of traffic. And even if you are, it doesn’t mean anything if those visitors don’t result in conversions. So when it comes to content management tools, simply providing users with data on web traffic won’t cut it. According to a study released by Cisco, 67% of all content consumption will be video-based by the year 2017. But this doesn’t necessarily mean that all video will consist of high-end productions. In fact, the majority of video content will likely be crowd-sourced as consumer-generated content will gain popularity. Content management systems need to make it easy for contributors to embed videos in webpages, regardless of which video platform is used. In addition, the automatic syndication of videos from social media channels will become a mandate. Content management is no longer about web content only. And while the ability to share pieces of content across multiple pages and sites is imperative for content management systems, CMSs should no longer be viewed as just a tool to push content to the web. Instead, we’re seeing a shift towards leveraging the CMS as a data warehouse that allows you to publish content to as many different platforms and in as many different formats as you need to. After all, new platforms that need to consume content and display it to consumers arise all the time, so “create once, publish everywhere” (COPE) is the only sustainable way to manage the content for your organization. There certainly is no shortage of CMSs that have to make this process much more seamless. To learn more, please click here to download Hannon Hill’s COPE whitepaper. In order to implement a COPE-conducive environment, we have to move away from the concept of monolithic WYSIWYG editors. Karen McGrane has been a thought leader in the world of content strategy for many years, and she often talks about the concept of smart chunks versus dumb blobs. Sure, it’s tempting to show end users that they can simply enter content into a big WYSIWYG, but it is not a scalable solution. It is impossible to strategically push parts of the content in the WYSIWYG editor to different platforms. It’s an all or nothing approach (“dumb blob”). However, giving end users the ability to enter content in more structured fields provides you with the “smart chunks” model, which lets you publish targeted content to as many different platforms in as many different formats as you need to. Content contributors need to be empowered to think about their content and their audience instead of styling and presentation. So while the WYSIWYG editor may not be laid to rest in 2016, we will (hopefully) see a decline in the “dumb blobs” approach and more of a push towards smart chunks. While we are moving away from the monolithic WYSIWYG editor, end users will still want to make changes to the layout of their web pages on an ad hoc basis. Systems that had so much flexibility (drag and drop galore) that it significantly jeopardizes brand consistency and, as a result, the visitor experience. CMSs that were so rigid that every time an organization or a user needed even a minor change to the layout of a template, they had to go through a developer resource, or, even worse, through the CMS vendor. In 2016, CMSs who support more of a “one template approach” will gain popularity by giving website administrators full control flexibility for contributors. The idea is to let end users switch between different predetermined approved layouts without losing any of the content. Until a few years ago, the purpose of websites was simply to house content. Any content. But today, consumers demand so much more from your online presence. They fully expect a holistic experience with your organization on your website, on your microsites and on social media. In addition, your audience has become used to being served content that’s relevant to them at different points in time during their online experience with your organization. Visitors will consider having to use the search box on your site a sign for bad customer service, so a lot more thought has to be put into your information architecture. Content management and content marketing tools will need to empower users to identify problem areas and make adjustments quickly. Furthermore, the ability to deliver custom content to your audience based on what you know about each persona will become another mandate that needs to be supported by technology. As you can see, it’s an exciting time to be a content contributor, a web strategist, and a CMS provider. 2016 will continue to make the web a better place. What will be some other emerging content management and content marketing trends in 2016?